CARFAX One-Owner. 3rd row seats: bench, Blind spot sensor: Blind Spot Warning warning, Electronic Stability Control, Front dual zone A/C, Fully automatic headlights, Heated door mirrors, Heated Front Seats, Heated front seats, Illuminated entry, Leatherette Seat Trim, Power Liftgate, Power moonroof, Reclining 3rd row seat, Remote keyless entry, Split folding rear seat, Steering wheel mounted audio controls, Wheels: 18" Triple 5-Spoke Aluminum-Alloy. Recent Arrival! Don't be fooled by inferior Certifications. 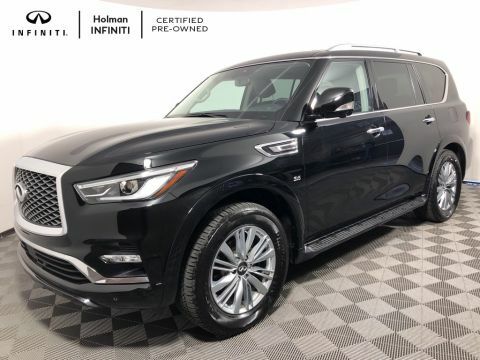 Each Holman Certified Pre-Owned vehicle receives a comprehensive 156-point inspection from one of our expert INFINITI certified technicians to ensure the vehicle is ready for the long road ahead. Our detail department then meticulously cleans each vehicle from front-to-back to ensure the Holman-Certified Pre-Owned vehicle with which you are presented is in peak cosmetic condition. Holman Certified Vehicles can each receive an optional Used Vehicle Limited Warranty 6 months/6,000 miles (whichever comes first). These warranties include roadside assistance, emergency travel expense reimbursement, destination assistance, and rental car reimbursement. 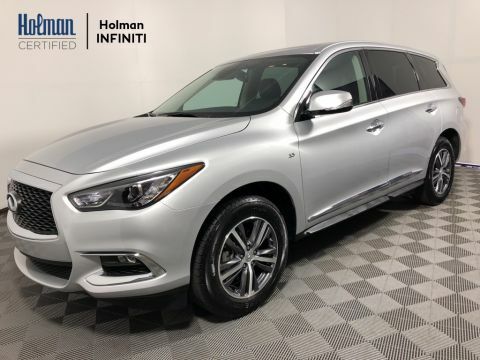 19/26 City/Highway MPG Come in and see this beautiful 2019 INFINITI QX60 today before it's gone! Only at Holman INFINITI of Maple Shade! CARFAX One-Owner. 3rd row seats: bench, AM/FM/CD Audio System, Automatic temperature control, Blind spot sensor: Blind Spot Warning warning, Fully automatic headlights, Heated Front Seats, Leatherette Seat Trim, Power Liftgate, Power moonroof, Power passenger seat, Reclining 3rd row seat, Remote keyless entry, Split folding rear seat, Steering wheel mounted audio controls, Wheels: 18" Triple 5-Spoke Aluminum-Alloy. Recent Arrival! This INFINITI Certified Pre-Owned Vehicle Receives a 6 Year 75,000 Mile warranty. 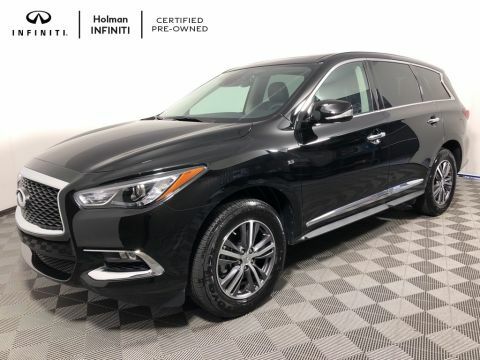 Our Certified inventory, unlike most dealerships, is not based upon just the qualification of the manufacturer, here at Holman INFINITI we hand pick which late model cars will be Certified. Each INFINITI Certified Pre-Owned vehicle receives a thorough 167-point inspection from one of our INFINITI CERTIFIED Technicians to ensure the vehicle is in peak mechanical condition. This stringent qualification requires items like brakes and tires be replaced if they fall below the 50% mark. 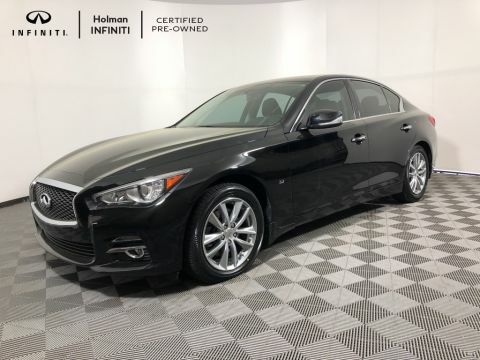 Once the vehicle completes it's meticulous servicing it is handed off to our Certified Detail Team for a world class detail from front-to-back to ensure the Certified Pre-Owned INFINITI with which you are presented looks like new. Benefits of purchasing an INFINITI Certified Pre-Owned vehicle include: Courtesy INFINITI loaners Complimentary first year basic maintenance. CARFAX Vehicle History Report. CARFAX 3-year Buy Back Guarantee. Free 3-month trial subscription to SiriusXM Satellite Radio. Emergency Roadside Assistance. Complimentary Service Courtesy Vehicle. Available INFINITI Elite extended Protection Program. Certified. 19/26 City/Highway MPG INFINITI Certified Pre-Owned Details: * Vehicle History * Roadside Assistance * Transferable Warranty * Warranty Deductible: $0 * 167 Point Inspection * Limited Warranty: 72 Month/Unlimited Mile (whichever comes first) Limited Warranty 72 months/Unlimited miles from original in-service date for vehicles over 15,000 miles & under 2 years old, 24 months/Unlimited miles from certified purchase date for vehicles over 15,000 miles & older than 2 years * Includes Rental Car and Trip Interruption Reimbursement Come in and see this beautiful 2019 INFINITI QX60 today before it's gone! Only at Holman INFINITI of Maple Shade! CARFAX One-Owner. 3rd row seats: bench, Automatic temperature control, Blind spot sensor: Blind Spot Warning warning, Fully automatic headlights, Heated Front Seats, Leatherette Seat Trim, Power Liftgate, Power moonroof, Reclining 3rd row seat, Remote keyless entry, Split folding rear seat, Steering wheel mounted audio controls, Wheels: 18" Triple 5-Spoke Aluminum-Alloy. Recent Arrival! This INFINITI Certified Pre-Owned Vehicle Receives a 6 Year 75,000 Mile warranty. Our Certified inventory, unlike most dealerships, is not based upon just the qualification of the manufacturer, here at Holman INFINITI we hand pick which late model cars will be Certified. Each INFINITI Certified Pre-Owned vehicle receives a thorough 167-point inspection from one of our INFINITI CERTIFIED Technicians to ensure the vehicle is in peak mechanical condition. This stringent qualification requires items like brakes and tires be replaced if they fall below the 50% mark. Once the vehicle completes it's meticulous servicing it is handed off to our Certified Detail Team for a world class detail from front-to-back to ensure the Certified Pre-Owned INFINITI with which you are presented looks like new. Benefits of purchasing an INFINITI Certified Pre-Owned vehicle include: Courtesy INFINITI loaners Complimentary first year basic maintenance. CARFAX Vehicle History Report. CARFAX 3-year Buy Back Guarantee. Free 3-month trial subscription to SiriusXM Satellite Radio. Emergency Roadside Assistance. Complimentary Service Courtesy Vehicle. Available INFINITI Elite extended Protection Program. Certified. 19/26 City/Highway MPG INFINITI Certified Pre-Owned Details: * Warranty Deductible: $0 * 167 Point Inspection * Transferable Warranty * Includes Rental Car and Trip Interruption Reimbursement * Limited Warranty: 72 Month/Unlimited Mile (whichever comes first) Limited Warranty 72 months/Unlimited miles from original in-service date for vehicles over 15,000 miles & under 2 years old, 24 months/Unlimited miles from certified purchase date for vehicles over 15,000 miles & older than 2 years * Vehicle History * Roadside Assistance Come in and see this beautiful 2019 INFINITI QX60 today before it's gone! Only at Holman INFINITI of Maple Shade! CARFAX One-Owner. 3rd row seats: bench, Automatic temperature control, Blind spot sensor: Blind Spot Warning warning, Fully automatic headlights, Heated Front Seats, Leather steering wheel, Leatherette Seat Trim, Power Liftgate, Power moonroof, Reclining 3rd row seat, Remote keyless entry, Split folding rear seat, Steering wheel mounted audio controls, Wheels: 18" Triple 5-Spoke Aluminum-Alloy. 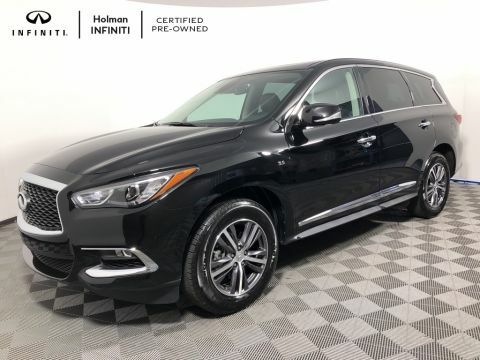 Black Obsidian 2019 INFINITI QX60 PURE FWD CVT 3.5L V6 Every INFINITI Certified Pre-Owned Vehicle Receives a 6 Year UNLIMITED Mileage warranty, an industry leading Certified Warranty. Our Certified inventory, unlike most dealerships, is not based upon just the qualification of the manufacturer. Here at Holman INFINITI we hand pick which late model cars will receive Certification. Each INFINITI Certified Pre-Owned vehicle receives a thorough 167-point inspection from one of our INFINITI CERTIFIED technicians to ensure the vehicle is in peak mechanical condition. This stringent qualification requires items such as brakes and tires to be replaced if they fall below the 50% mark. Once the vehicle completes it's meticulous servicing it is handed off to our Certified Detail Team for a world class detail from front-to-back to ensure the Certified Pre-Owned INFINITI with which you are presented looks like new. Benefits of purchasing an INFINITI Certified Pre-Owned vehicle include: Courtesy INFINITI loaners Complimentary first year basic maintenance. CARFAX Vehicle History Report. CARFAX 3-year Buy Back Guarantee. Free 3-month trial subscription to SiriusXM Satellite Radio. Emergency Roadside Assistance. Complimentary Service Courtesy Vehicle. Available INFINITI Elite extended Protection Program. Recent Arrival! 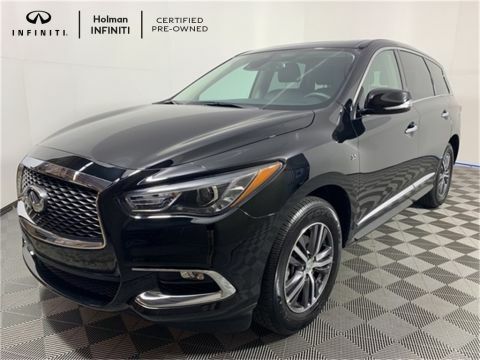 20/27 City/Highway MPG Come in and see this beautiful 2019 INFINITI QX60 today before it's gone! Only at Holman INFINITI! CARFAX One-Owner. 3rd row seats: split-bench, Automatic temperature control, Backup Collision Intervention (BCI), Blind Spot Intervention (BSI), Blind Spot Warning, Fully automatic headlights, Heated Front Bucket Seats, Heated steering wheel, Intelligent Cruise Control (Full-Speed Range), Leather-Appointed Seats w/Stratford Burl Trim, Memory seat, Navigation system: INFINITI InTouch Navigation, Power Liftgate, Power moonroof, ProASSIST Package, Reclining 3rd row seat, Remote keyless entry, Split folding rear seat, Steering wheel memory, Steering wheel mounted audio controls, Wheels: 20" x 8.0" Aluminum-Alloy. 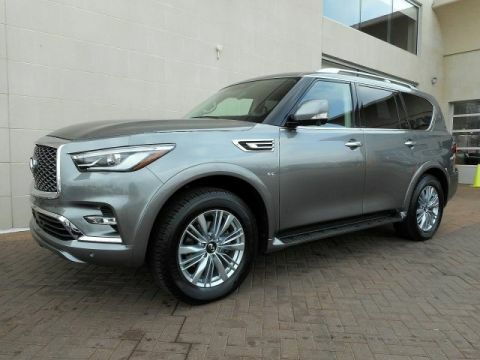 Mocha Almond 2019 INFINITI QX80 LUXE AWD 7-Speed Automatic 5.6L V8 Every INFINITI Certified Pre-Owned Vehicle Receives a 6 Year UNLIMITED Mileage warranty, an industry leading Certified Warranty. Our Certified inventory, unlike most dealerships, is not based upon just the qualification of the manufacturer. Here at Holman INFINITI we hand pick which late model cars will receive Certification. Each INFINITI Certified Pre-Owned vehicle receives a thorough 167-point inspection from one of our INFINITI CERTIFIED technicians to ensure the vehicle is in peak mechanical condition. This stringent qualification requires items such as brakes and tires to be replaced if they fall below the 50% mark. Once the vehicle completes it's meticulous servicing it is handed off to our Certified Detail Team for a world class detail from front-to-back to ensure the Certified Pre-Owned INFINITI with which you are presented looks like new. Benefits of purchasing an INFINITI Certified Pre-Owned vehicle include: Courtesy INFINITI loaners Complimentary first year basic maintenance. CARFAX Vehicle History Report. CARFAX 3-year Buy Back Guarantee. Free 3-month trial subscription to SiriusXM Satellite Radio. Emergency Roadside Assistance. Complimentary Service Courtesy Vehicle. Available INFINITI Elite extended Protection Program. INFINITI Certified Pre-Owned Details: * Limited Warranty: 72 Month/Unlimited Mile (whichever comes first) Limited Warranty 72 months/Unlimited miles from original in-service date for vehicles over 15,000 miles & under 2 years old, 24 months/Unlimited miles from certified purchase date for vehicles over 15,000 miles & older than 2 years * Includes Rental Car and Trip Interruption Reimbursement * Transferable Warranty * Roadside Assistance * Vehicle History * Warranty Deductible: $0 * 167 Point Inspection Come in and see this beautiful 2019 INFINITI QX80 today before it's gone! Only at Holman INFINITI! CARFAX One-Owner. 3rd row seats: split-bench, Automatic temperature control, Backup Collision Intervention (BCI), Blind Spot Intervention (BSI), Blind Spot Warning, Fully automatic headlights, Heated Front Bucket Seats, Heated steering wheel, Intelligent Cruise Control (Full-Speed Range), Leather-Appointed Seats w/Stratford Burl Trim, Memory seat, Navigation system: INFINITI InTouch Navigation, Power Liftgate, Power moonroof, ProASSIST Package, Radio: AM/FM/HD w/Single In-Dash CD/DVD Player & MP3, Reclining 3rd row seat, Remote keyless entry, Split folding rear seat, Steering wheel memory, Steering wheel mounted audio controls, Wheels: 20" x 8.0" Aluminum-Alloy. 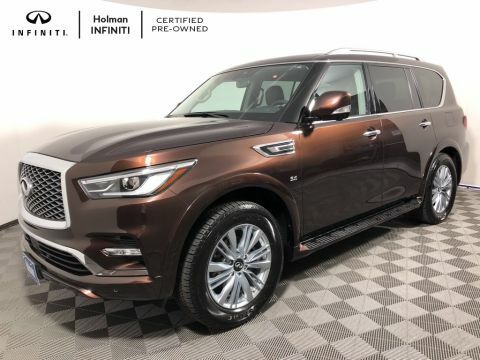 Mocha Almond 2019 INFINITI QX80 LUXE AWD 7-Speed Automatic 5.6L V8 Every INFINITI Certified Pre-Owned Vehicle Receives a 6 Year UNLIMITED Mileage warranty, an industry leading Certified Warranty. Our Certified inventory, unlike most dealerships, is not based upon just the qualification of the manufacturer. Here at Holman INFINITI we hand pick which late model cars will receive Certification. Each INFINITI Certified Pre-Owned vehicle receives a thorough 167-point inspection from one of our INFINITI CERTIFIED technicians to ensure the vehicle is in peak mechanical condition. This stringent qualification requires items such as brakes and tires to be replaced if they fall below the 50% mark. Once the vehicle completes it's meticulous servicing it is handed off to our Certified Detail Team for a world class detail from front-to-back to ensure the Certified Pre-Owned INFINITI with which you are presented looks like new. Benefits of purchasing an INFINITI Certified Pre-Owned vehicle include: Courtesy INFINITI loaners Complimentary first year basic maintenance. CARFAX Vehicle History Report. CARFAX 3-year Buy Back Guarantee. Free 3-month trial subscription to SiriusXM Satellite Radio. Emergency Roadside Assistance. Complimentary Service Courtesy Vehicle. Available INFINITI Elite extended Protection Program. INFINITI Certified Pre-Owned Details: * Transferable Warranty * Limited Warranty: 72 Month/Unlimited Mile (whichever comes first) Limited Warranty 72 months/Unlimited miles from original in-service date for vehicles over 15,000 miles & under 2 years old, 24 months/Unlimited miles from certified purchase date for vehicles over 15,000 miles & older than 2 years * Vehicle History * Roadside Assistance * Warranty Deductible: $0 * 167 Point Inspection * Includes Rental Car and Trip Interruption Reimbursement Come in and see this beautiful 2019 INFINITI QX80 today before it's gone! Only at Holman INFINITI! CARFAX One-Owner. 3rd row seats: split-bench, Automatic temperature control, Fully automatic headlights, Heated Front Bucket Seats, Heated steering wheel, Leather-Appointed Seats w/Stratford Burl Trim, Memory seat, Navigation system: INFINITI InTouch Navigation, Power Liftgate, Power moonroof, Radio: AM/FM/HD w/Single In-Dash CD/DVD Player & MP3, Reclining 3rd row seat, Remote keyless entry, Split folding rear seat, Steering wheel memory, Steering wheel mounted audio controls, Wheels: 20" x 8.0" Aluminum-Alloy. Odometer is 1780 miles below market average! 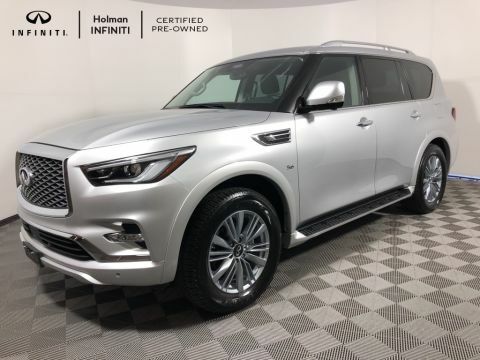 Liquid Platinum 2019 INFINITI QX80 LUXE AWD 7-Speed Automatic 5.6L V8 Every INFINITI Certified Pre-Owned Vehicle Receives a 6 Year UNLIMITED Mileage warranty, an industry leading Certified Warranty. Our Certified inventory, unlike most dealerships, is not based upon just the qualification of the manufacturer. Here at Holman INFINITI we hand pick which late model cars will receive Certification. Each INFINITI Certified Pre-Owned vehicle receives a thorough 167-point inspection from one of our INFINITI CERTIFIED technicians to ensure the vehicle is in peak mechanical condition. This stringent qualification requires items such as brakes and tires to be replaced if they fall below the 50% mark. 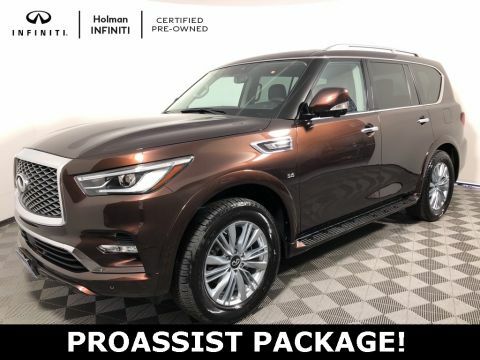 Once the vehicle completes it's meticulous servicing it is handed off to our Certified Detail Team for a world class detail from front-to-back to ensure the Certified Pre-Owned INFINITI with which you are presented looks like new. Benefits of purchasing an INFINITI Certified Pre-Owned vehicle include: Courtesy INFINITI loaners Complimentary first year basic maintenance. CARFAX Vehicle History Report. CARFAX 3-year Buy Back Guarantee. Free 3-month trial subscription to SiriusXM Satellite Radio. Emergency Roadside Assistance. Complimentary Service Courtesy Vehicle. Available INFINITI Elite extended Protection Program. Recent Arrival! INFINITI Certified Pre-Owned Details: * Transferable Warranty * Includes Rental Car and Trip Interruption Reimbursement * Vehicle History * Roadside Assistance * Limited Warranty: 72 Month/Unlimited Mile (whichever comes first) Limited Warranty 72 months/Unlimited miles from original in-service date for vehicles over 15,000 miles & under 2 years old, 24 months/Unlimited miles from certified purchase date for vehicles over 15,000 miles & older than 2 years * Warranty Deductible: $0 * 167 Point Inspection Come in and see this beautiful 2019 INFINITI QX80 today before it's gone! Only at Holman INFINITI! Navigation system: INFINITI InTouch Navigation,13 Speakers,AM/FM radio: SiriusXM,CD player,DVD-Audio,Radio data system,Radio: AM/FM/HD w/Single In-Dash CD/DVD Player & MP3,Rear audio controls,Air Conditioning,Automatic temperature control,Front dual zone A/C,Rear air conditioning,Rear window defroster,Memory seat,Power driver seat,Power steering,Power windows,Remote keyless entry,Steering wheel memory,Steering wheel mounted audio controls,Auto-leveling suspension,Four wheel independent suspension,Speed-sensing steering,Traction control,4-Wheel Disc Brakes,ABS brakes,Anti-whiplash front head restraints,Dual front impact airbags,Dual front side impact airbags,Emergency communication system: INFINITI Connection,Front anti-roll bar,Low tire pressure warning,Occupant sensing airbag,Overhead airbag,Rear anti-roll bar,Power moonroof,Power Liftgate,Brake assist,Electronic Stability Control,Auto High-beam Headlights,Delay-off headlights,Front fog lights,Fully automatic headlights,Panic alarm,Security system,Speed control,Auto-dimming door mirrors,Bumpers: body-color,Heated door mirrors,Power door mirrors,Roof rack: rails only,Spoiler,Turn signal indicator mirrors,Auto tilt-away steering wheel,Auto-dimming Rear-View mirror,Driver door bin,Driver vanity mirror,Front reading lights,Garage door transmitter: HomeLink,Genuine wood console insert,Genuine wood dashboard insert,Genuine wood door panel insert,Heated steering wheel,Illuminated entry,Leather Shift Knob,Leather steering wheel,Outside temperature display,Overhead console,Passenger vanity mirror,Rear reading lights,Rear seat center armrest,Tachometer,Telescoping steering wheel,Tilt steering wheel,Trip computer,Voltmeter,3rd row seats: split-bench,Front Bucket Seats,Front Center Armrest,Heated Front Bucket Seats,Heated front seats,Leather-Appointed Seats w/Stratford Burl Trim,Power passenger seat,Reclining 3rd row seat,Split folding rear seat,Passenger door bin,Wheels: 20" x 8.0" Aluminum-Alloy,Rain sensing wipers,Rear window wiper,Variably intermittent wipers,2.94 Axle Ratio,Fresh Oil Change,Only buy from the areas #1 Cadillac Certified Dealer! Cadillac Certified Warranty until Call,125 Point Safety Inspection on all Pre-owned Vehicles! !